Two-time champions Argentina are on the brink of elimination from the ongoing FIFA World Cup in Russia after they were beaten 3-0 by Croatia in their second Group D at the tournament. Jorge Sampaoli’s men had surprisingly played out a 1-1 draw with first timers Iceland in their opening match and needed a win against Croatia to boost their knockout stage qualification hopes only for them to capitulate against the Europeans. Croatia had the better chances in the first half as Argentina struggled to fashion out decent opportunities but both defences came out on top with their clean sheets intact. That however changed after the interval when a clanger from Argentina goalkeeper Willy Caballero led to the opening goal from Croatian forward Ante Rebic with eight second half minutes gone. Argentina pressed for an equaliser and were close to getting it when Barcelona midfielder Ivan Rakitic made a goal line clearance in the most notable action from the Argentines. Croatia thereafter extended their lead after Luka Modric produced a fine finish in the 80th to take the game beyond their opponents before the aforementioned Rakitic scored a third goal in added time. 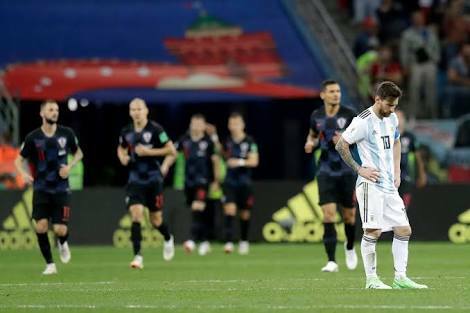 The 3-0 scoreline is the worst group stage defeat suffered by Argentina in 60 years, since a 6-1 loss to Czechoslovakia at the 1958 World Cup in Sweden. On the other hand, Croatia are through to the knockout stage for the first time since the 1998 World Cup as they join hosts Russia, Uruguay and France in the last 16. Argentina may now have to rely on other results favouring them as they go into their final group game against the Super Eagles of Nigeria.